Each day’s reading includes a significant Scripture, powerful insight into experiencing God’s goodness, and an invitation to claim the rest, peace and encouragement available in Christ, whatever your circumstances. Pastor Johnson captures the essence of biblical truth with insight and clarity while creating an intimate conversational atmosphere for communicating an important application, principle, or promised blessing. “Encountering the Goodness of God” is designed for those seeking to see things from God’s perspective, to live as Jesus lived, to be “at home” in His presence, and to encounter more of his boundless goodness. “Healing in His Presence – The Untold Secrets of Kathryn Kuhlman’s Healing Ministry and Relationship with the Holy Spirit” is written with the express purpose of sharing unique salvation stories and miraculous healing testimonies with important secrets of Kathryn Kuhlman’s ministry to reveal important transferable concepts available to all believers. Joan Gieson humbly relates experiences and observations of her relationship with Kathryn Kuhlman over an eight-year period of association with the healing ministry. “Healing in His Presence” is an unassuming story with a dynamic power and a life-changing message. Gieson describes Miss Kuhlman as a captivating presence. The spirit of God was with her all the time. She never stopped pursuing God’s heart. Generations were reached and continue to be touched by Kathryn Kuhlman’s childlike faith in God’s healing power. After her dramatic healing from blindness through Kathryn Kuhlman’s ministry Joan Gieson, with her husband Frank, worked closely with Miss Kuhlman, They also actively arranged bus and other transportation for sick the sick, physically impaired to attend the healing services. A concluding prayer of impartation challenges the reader to step out in compassion to be the person God created and designed them to be. Skeptics, seekers, and Spirit-filled Christians will all sense a touch of the miraculous as they read of lives changed by the healing power of Jesus. 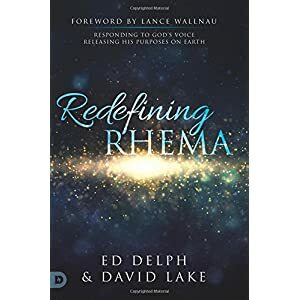 Worldwide ministry leader, Ed Delph, and David Lake, pastor, business owner, and marketplace ministry collaborate in this deeply challenging analysis of the principal of the Greek word Rhema as used in the Word of God. In their book “Redefining Rhema – Responding to God’s Voice Releasing His Purposes on Earth” address a Biblical reality of hearing first and speaking second. The authors are forthright, confident, and authoritative in their presentation. Their work is well documented with a balance of apostolic gift driven ministry and mainstream Christian theology. Pastors, Global Christian Leaders, and other Visionary Missional Leaders highly endorse the book. Important evidence of validation of the principles presented in the book is found in the chapter “Illuminating Leaders, and Influencers, and mind molders.” In this chapter both men relate testimonies of God’s working in their life story through, a faith-infused utterance from God, providing illumination and direction, clarity and instruction in the next step in their lives. A complimentary copy of this book was given for review purposes. The opinions expressed are my own. “Prophetic Break Through – Decrees that Break Curses & Release Blessings” is designed to communicate, empower and equip the reader to better understand and recognize the importance of prophetic declarations in living out God’s divine purpose, and a life of overcoming spiritual warfare. The book is divided into two parts. Part one includes instruction on prophetic breakthrough, prophetic vision, breaking curses, releasing blessings, waging prophetic warfare, and breaking ungodly soul ties. Part two is a 90 day devotional with activations to release blessing and break curses. Each of the devotionals contains a Scripture verse for the day, teaching and encouragement, additional Scriptural references to read, an awe-inspiring breakthrough prayer, and several powerful declarations or degrees for breaking curses and releasing blessings. “Prophetic Break Through” is an important tool for today’s believer who is seeking to activate their faith, access the power of God, and experience fulfillment. Must reading for anyone feeling stagnant in their spiritual walk. In her book “The Seer’s Path, an Invitation to Experience Heaven, Angels, and the Invisible Realm of the Spirit” Ana Werner describes her incredible encounters with the Lord Jesus. Throughout the book Werner addresses questions regarding the gift of the Seer, the marvels of heaven, spiritual; warfare, revelatory visions, and evangelizing. “The Seer’s Path” is uniquely organized using the term “activation” as it relates to specific chapter themes, prayers, and discussion questions. I found the “activation prayers” to be wonderful models, preparing hearts for worship, thanksgiving, and introspection, leading to soul searching confession, and commitment. The discussion questions at the end of each chapter are carefully designed for self-examination, leading to a commitment to take specific action. Werner is passionate about her message, direct in her approach, and powerful in her presentation. She is confident in her writing style and known for her transparency, spirit filled ministry, and love for sharing the heart of Jesus and the message of the gospel. In his book “Baptized in the Spirit – God’s Presence Resting Upon You with Power” Randy Clark, presents a definitive study on the Baptism of the Holy Spirit. The book is the culmination of years of study, application, and personal experience in areas operating in the gifts of the Holy Spirit, prophecies, the gift of tongues, and the gift of impartation. Dr. Clark understands the depth of diversity and opinions prevalent today in Apostolic teaching and Pneumatology. Part One describes and defines the Scriptural, historical, and theological, perspectives of six different positions taken on the Baptism of the Holy Spirit. Part Two provides an introduction to the subject of experiencing the baptism of the Spirit, receiving the baptism, and evidences of the baptism. Clark shares his own story as well as the personal testimonies of a broad spectrum of Christian leaders from different eras and backgrounds to illustrate how individual experiences vary. These stories attest that baptisms have occurred at the time of salvation, deliverance, or surrender. In Part Three, Dr. Jon Ruthven, a mentor of Clark, presents “A New Biblical Understanding of the Sprit.” Ruthven compares Theological traditions on the baptism in the Holy Spirit with the central mission and message of Jesus on the Holy Spirit as found in the four Gospels. Part Four covers issues of holiness, equipping, revival, and more testimonies of Holy Spirit Baptism. Clark delivers a masterful, Biblically based, historically accurate, and theologically sound resource that crosses denominational positions. “Baptized in the Spirit – God’s Presence Resting Upon You with Power” is destined to become required reading in seminaries, leadership workshops, and seminars.. Theological Professors, Pulpit Ministers, and Bible Teachers, professional and lay, will appreciate Clark’s thorough research, documentation, detailed chapter end-notes, and extensive bibliography. Randy Clark founder of Global Awakening earned a DMin from United Theological Seminary and is highly recognized by his peers for his credibility and integrity. He is in demand as an speaker, in Bible conferences, international missions, and as a leader in the Apostolic movement. The Operating in the Courts of Heaven series introduces a prayer strategy for bringing your appeals before the courtroom of heaven. The “Unlocking Destinies from the Courts of Heaven – Interactive Manual” is designed to be used as a part of the Courts of Heaven Curriculum. The book follows the same session sequence as the DVD teaching schedule. Each Session opens with a viewing of a selection from the DVD Study which served as a basis for the material considered in the session and all of the other elements of the course curriculum. This is followed with an Introductory Statement and Summary which highlights the theme of the material covered. Profound interactive questions stimulate discuss of the material covered in the DVD presentation. This discussion is followed by An Activation Exercise which will help participants process and implement the information presented. The Activation exercises can be done in a group setting or by an individual. Daily Devotional readings, suggested Bible study questions, a reflection, or suggested prayer are included to be used throughout the week following each session. Robert Henderson is a trailblazer in apostolic teaching in areas of revelation, and impartation. He is recognized internationally and travels extensively with a commitment to disciple nations while he delivers his message of the Kingdom of God, and the Courts of Heaven. A complimentary copy of this book was provided for review purposes.